Michigan electric utilities in 2016 generated nearly 1.5 million tons of coal ash, a waste material that can threaten water with arsenic, lead and mercury, according to a recent report. The toxic ash is often placed in landfills and waste ponds next to power plants and can contaminate nearby groundwater, according to a Michigan Environmental Council study of data reported for the first time this fall by the state’s 13 coal-fired power plants. Federal air quality standards in 2015 required utilities to monitor groundwater near their coal ash ponds and publicly post the data. That data was released by individual utilities last January. “For decades, utilities were essentially allowed to dump this toxic coal ash sludge — which has mercury, arsenic, lead and a whole host of other toxic metals in it — next to coal plants,” said Charlotte Jameson, the author of the report. DTE Energy’s Monroe coal plant accounted for more than half of the coal ash generated in the state. These toxic metals leach into the ground and surface water over time, Jameson said. Human exposure can lead to cancer, cardiovascular disease, neurological disorders, kidney and liver damage and lowered IQ in children, according to the National Center for Biotechnology Information based in Bethesda, Maryland. Of the 22 coal ash sites listed in the report, 17 showed levels of toxic chemicals like arsenic and lead above state and federal drinking water standards in the groundwater aquifers nearby. Experts are unsure if this contamination will eventually migrate into drinking water. It’s likely that the annual amount produced will decline. Coal-powered plants accounted for 37 percent of the state’s net electricity generation in 2017, down from 50 percent in 2016. Michigan’s two largest utilities, DTE Energy and Consumers Energy, have already begun to phase out coal in favor of natural gas. DTE Energy plans to halt all use of coal by 2050 and Consumers Energy by 2040. 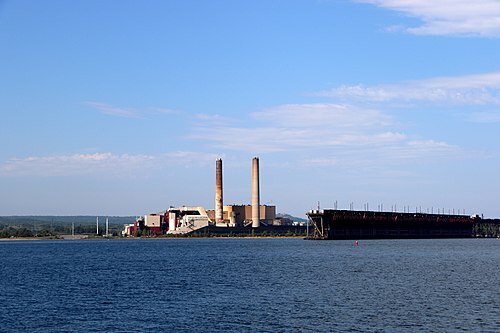 The Shiras Power Plant in Marquette permanently switched to natural gas in June after a two-year process to end coal production, Noreen Collins, the executive assistant and community relations coordinator at the Marquette Board of Light and Power, wrote in an email. The Presque Isle Power Plant, also in Marquette and operated by We Energies, generated 54,000 tons of coal ash in 2016 — 3.8 percent of the state’s total. The plant is set to be replaced by two natural gas-fueled facilities in 2020. Natural gas creates about the same amount of energy as coal but with half the carbon dioxide emissions, said Nate Verhanovitz, a performance engineer at the T.B. Simon Power Plant on Michigan State University’s campus. Carbon dioxide is a greenhouse gas that contributes to global warming. Verhanovitz was on the team that converted MSU’s power plant from partially coal-burning to completely powered by natural gas in 2016. The recent addition of solar-powered carports provides 5 percent of the electricity used on campus. *Data compiled by Michigan Environmental Council from Energy Information Administration, “Power Plant Operations Report,” (Form 2016 EIA-923), 8/17/2018 https://www.eia.gov/electricity/data/eia923/ Some plants have been closed since the data was reported. It would be unusual for a newspaper to republish a report by a non-profit or government agency. This news report about that report was distributed to some 25 Michigan news organizations that are members of Michigan State University’s Capital News Service. Whether they publish it is an individual decision by each publication. Will this report be published in any newspaper. It looks like Now is a time for Edison to clean up and move the ash away from lake Erie. This report will knock the property values down and scare the parents of children. I have 3 14 yr old children and the report makes me worried for their health in the future.